Carlton Cattery have been caring for cats since 1990 when Tricia & Fred Stammer started the cattery. They provide an experienced, family run, purpose built cattery, offering a relaxed environment in beautiful countryside surroundings. Fred built Carlton Cattery himself using designs based on guidelines from the Feline Advisory Bureau, guidelines they still use today to help them run the cattery. The cattery is located in Headley on Ashford Hill Road off the A339 Basingstoke to Newbury road. Although classed as being in Thatcham our location is a 10 minute drive from both Thatcham and Newbury. The cat accommodations are individual, external, heated chalets that provide warmth and cover and include large runs for them to play in. 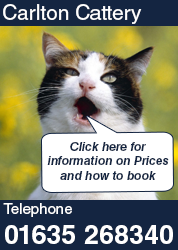 The cattery is licensed by Basingstoke & Deane Council and inspected annually. Our Vet is Donnington Grove Vets. However where possible we try to use our clients own Vet. We are insured by Pet Plan for both the Cats health and public liability insurance. Monday to Friday 9:00am. to 7:00pm. Friday 18th October 2019 to Monday 21st October 2019 inclusive. For more information about Carlton Cattery and the range of services we offer, call us on 01635 268340 or email us at info@carltoncattery.co.uk. Copyright © 2019 Carlton Cattery.